I promise this post isn't going to be all about selling you things. The broader message of this post is that this past week I've been very happy because over the course of a few days we had multiple sales, in multiple shops. I was so happy to keep getting email after email, after notification of sales! Both Zach & I are extremely happy about the success of the Vintage shop and really hope we can continue to create a wonderful shop curated by story telling. We've actually been thinking a lot about where we want to go with this in the future. Personally I can't wait to get the studio set up, seriously, we've been so close to completing the house for weeks. It's just one more thing here & one more thing there. I think we'll spend our first year in this house still putting it together! I am so thankful for every little sale that comes with this little adventure of ours. We've been putting together spreadsheet after spreadsheet (my preferred method after good old pen & paper!) tracking everything. I'm so excited! 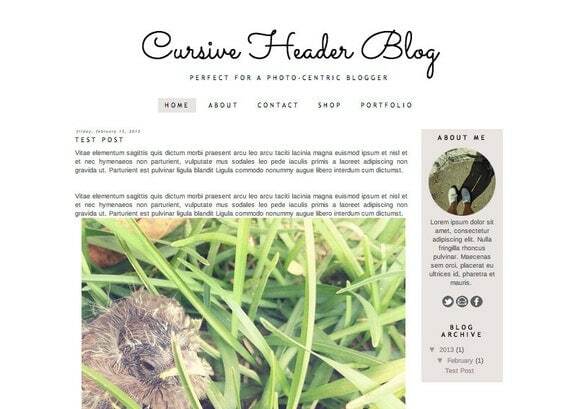 This is a pretty & feminine minimal design with a fun cursive header! Images automatically resize to fit the full width of the posting area & the side bar and nav bar have a pearly pink accent. I love the sans serif/cursive mix. I'm really in love with Trebuchet right now for some reason & all the new designs feature it I think! Minimal Minnie was designed with the Briar.Wood design in mind. The Briar.Wood design has been the most popular design in the shop! 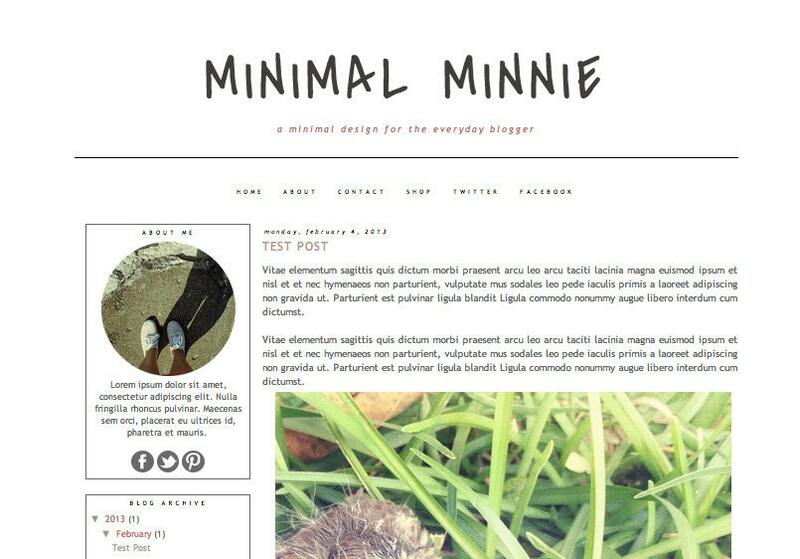 Another take on that sort of style is Minimal Minnie. 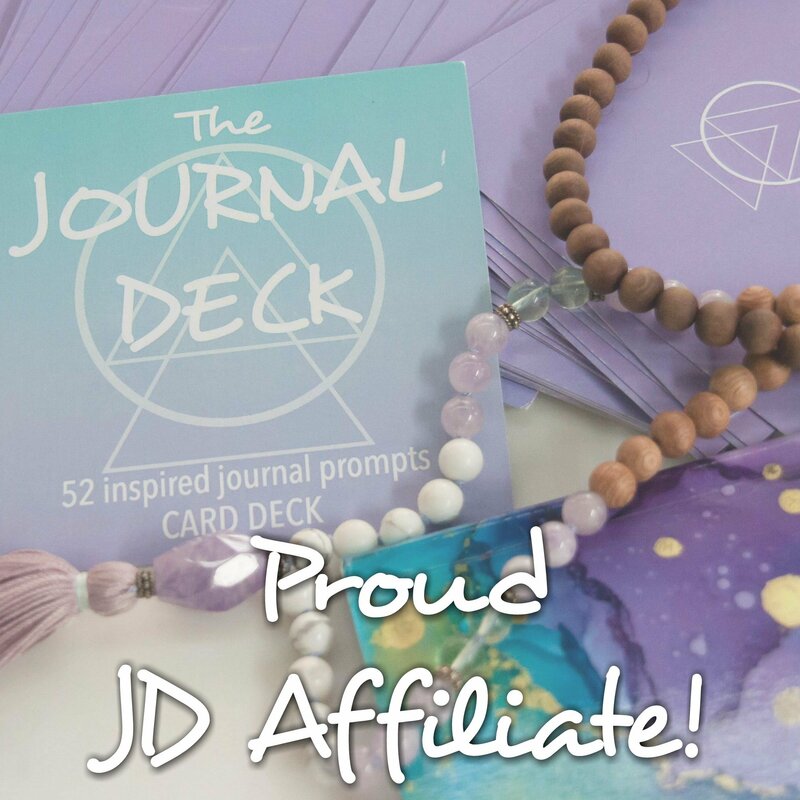 It has a handwritten blog header with mauve accents. 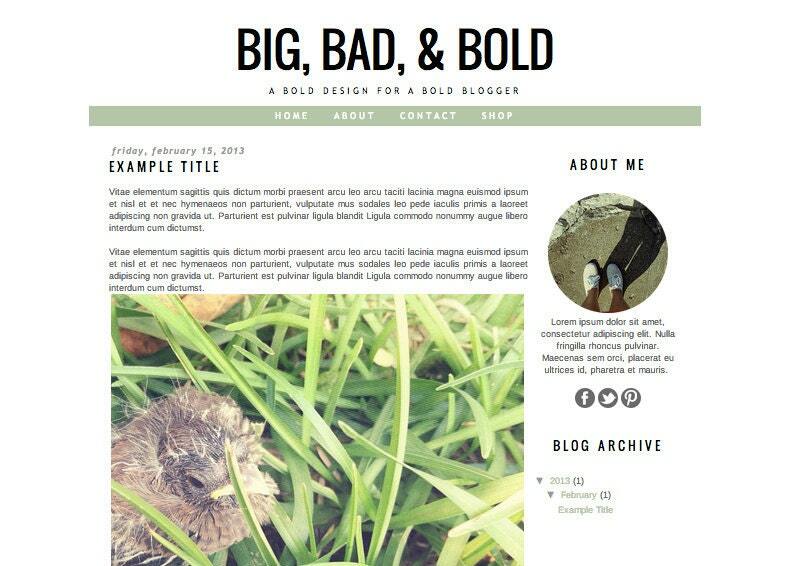 Big, Bad, & Bold features a bold & skinny sans serif font for the blog header, post title, & sidebar gadgets. The navigation bar is in mint with white text. All of these new designs can be customized with a load of upgrades in the shop but these are also included in the Mix & Match Custom Upgrade package. 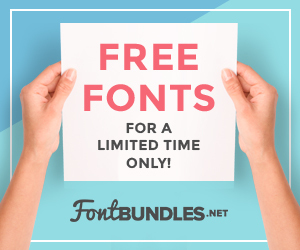 Add on three upgrades to any premium template for only $80! A totally custom look off of a premade design! Check out this post to see how it works. Along with customizable 2013 Tote Bags, a few different styles of Graduation Announcements in a bunch of color combos have been added. The stationery shop has continued to surprise me. I've been putting a lot into it & have been getting a bit of a return! It's so fun! 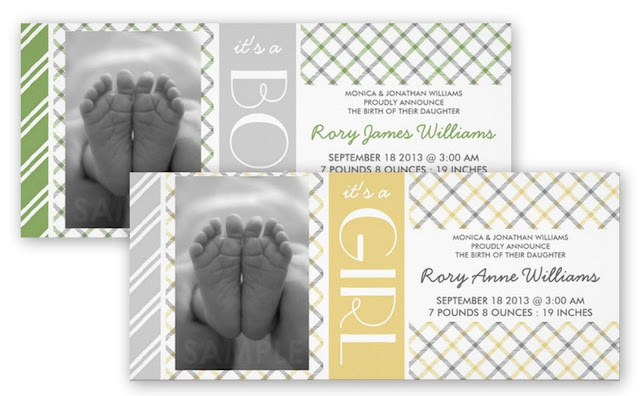 There are a ton of Spring time birth announcements in tartan, stripes, solid colors, & florals. There are going to be more & more hitting the shop soon! Plus there are wedding suites, business cards, & stationery for everyday correspondence! We found the pitcher separate from the glasses but on the same day. It was such a surprise how awesome they complimented each other! 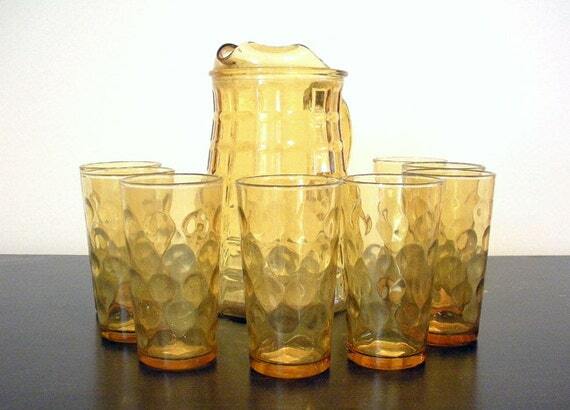 The pitcher has a waffle pattern while the glasses have a circle pattern. A great geometric mix. Perfect for summer gatherings & in great vintage condition. There are a few more new things in the vintage shop, but this has to be the prettiest! I also think that my camera charger is still in the apartment at Zach's parents' house. I can't find it anywhere but it could be in the crazy mess that is our house! That was a lot of stuff! Can you tell we've been working our butts off? I'm telling you though, I can't wait for March! Heck, I can't even wait for the rest of the month! I'm using too many exclamation marks! 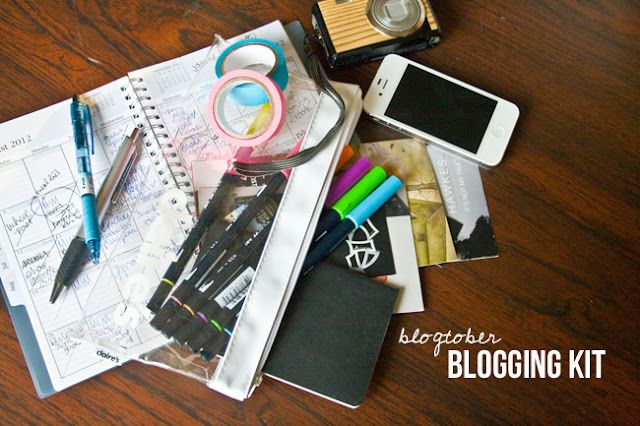 Use HEYTHEREHITHERE for 10% off a blog design purchase - that is anything! A custom design, the Mix & Match Package, a premade template, anything! Use PREZWKNDSALE for 15% off everything in the Stationery Shop - everything! There you have it, a very long winded (but very much needed) shop update post!